Neil Zurcher has been a professional journalist working mostly in television, where he covered world leaders and major events, like the asassinataion of President John F. Kennedy but he also worked in newspapers, magazines, and radio for over a half-century and has logged more than a million miles on Ohio’s roads over 35 years as a TV travel reporter. He was the original host of the “One Tank Trips” travel report, which aired on Fox8 Television in Cleveland and has since been imitated in other television markets throughout the US. Called “One of the most respected and knowledgeable travel writers in the state” by former Ohio Governor George Voinovich, Zurcher received the Distinguished Service award from the Society of Professional Journalism and the Silver Circle award from the National Academy of Television Arts and Sciences. He also received a “Emmy” award. In 2013 he was honored with a rare Gold Circle Award for his fifty years in television. He was given the coveted Award for Excellence in Broadcasting from the Cleveland Association of Broadcasters. He has been inducted into the Cleveland Press Club Hall of Fame. He was also inducted into the Ohio Broadcasters Hall of Fame and received their “Living Legacy” award in 2007. Zurcher for many years wrote a column for the Auto Club’s Ohio Motorist Magazine and for the Cleveland Plain Dealer and has written five books about Ohio, including Ohio Oddities and Strange Tales from Ohio. In 2012 he returned to television again doing One Tank Trips on Fox 8’s New Day Cleveland Show that airs each morning at 10 AM. In 2014 Neil marked sixty years as a professional journalist. When the “One Tank Trips” series started in the spring of 1980 we had a promise of the loan of a replica 1929 Model A Touring car from the Ford Motor Company to use in our opens and closes. Shortly before the series was to be shot I was informed that Ford had decided on some cost-saving cuts in their promotion budget and my “loaner” car was one of the cuts. The very first year we shot I used my family car, a 1979 Ford Futura, two-door sedan. We tied some boxes on the roof, stuck some water skis out of the window and tied a child’s plastic inflatable inner-tube to the rear of the car. To make it all look like a family car going on vacation. The second season I happened to mention to good friends, Bonnie and Bill Cutcher of Vermilion that I would like to use an antique car in the opening of the series. Bill, a car collector, offered to loan me his 1948 Lime Green Chevrolet Convertible. For the next couple of years we used this car. But it didn’t seem to resonate with the viewers. Most were confused by its size and thought I was driving a Cadillac. Bill then came up with a diminutive 1940 Bantam American Roadster, made in Butler, Pennsylvania and the forerunner of the World War II Jeep. This proved to be very popular with our viewers and I started to get questions about “where’s your car?” when I would make any public appearance. People wanted and expected to see me with the little Bantam. Since I didn’t own it and the Cutcher’s had been nice enough to make it available for some of our personal appearances, I could see that eventually either I, or the station, had to buy a car for the series. I settled on a 1959 Nash Metropolitan, a boxy little red and white convertible. Problem was: WJW-TV, also facing a budget crunch at the time, said no to my request to purchase the car. So, after discussing it with my wife, I paid for the car myself. The little Nash became as popular, if not more so than the Bantam. It had the advantage of being newer and more powerful and the ability to keep up with modern day traffic on freeways. Another plus was it was available for all kinds of appearances and parades at any time and, since I owned it, I no longer had to worry about fans scratching up someone else’s classic automobile. This soon became a problem. Because of the popularity of the “One Tank Trips” program the car was often recognized before I was. Everywhere we took it we eventually had to bring along an extra person to watch the car so that some over zealous fan did not cut pieces of the upholstery for souvenirs or try to take home a hubcap as a keepsake. As we approached the end of the 1990’s I decided it was time to replace the “Met” with a small car that we could carry to the assignments on a trailer. Use the car at the scene then put it back on the trailer and haul it back home. I purchased a tiny one-door, one-cylinder BMW 1957 Isetta. After 15months of frustration of trying to make the cantankerous little car run, I gave up and we moved on to a 1978 version of the Ford Model “A” that I had originally wanted to use in the series. I bought it from an estate in Ravenna and drove it for about a year and a half. It just didn’t catch on. People kept writing to me asking, “Where was the Nash Metropolitan”. At that time I had loaned the Nash to the Western Reserve Historical Society and they had it on display at their museum at University Circle in Cleveland. I went to the museum and asked for my car back. The Nash was with me up until just before the year 2000. By this time because of a leaky roof, motor problems and my own discomfort driving it I decided once more to find a replacement. While on a One Tank Trip to Johnstown, Pennsylvania I spotted a tiny red convertible sitting in a used car lot. It was about the same size as the Nash, but it was more modern. It was a 1993 Geo Metro Convertible with air condition, automatic transmission and even had AM-FM Stereo radio (All things the Nash Metropolitan did not have). It had very low mileage and seemed to be in great shape. We dickered over the price and I drove the Geo home. 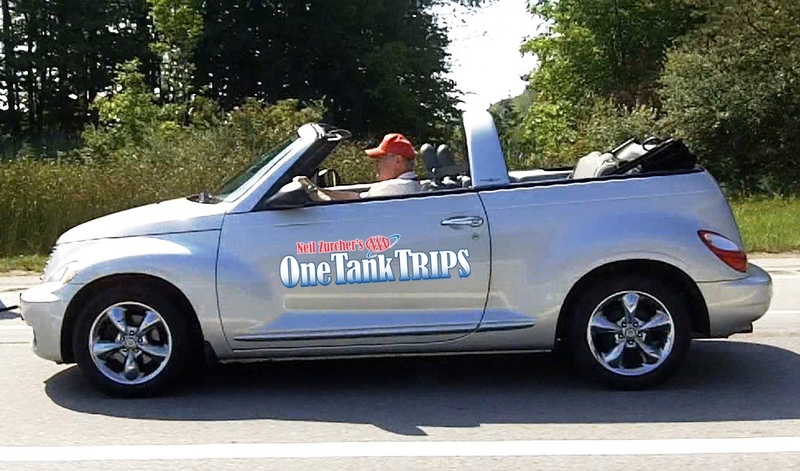 The “new” One Tank Trip car, a 2007 Chrysler PT Cruiser heading down the roads of Ohio to new adventure. Today: Bill and Bonnie Cutcher still own the 1948 Chevrolet. They have sold the 1940 Bantam when they moved to a new home. The1957 Isetta, I decided, was too cantankerous to ever be on the road again so my wife, Bonnie, and I donated the car to the Canton Classic Car Museum where today it shares space with my Metropolitan. We decided to sell both the Shay Model A replica and eventually we also sold the 1993 Geo. I frequently stop in at the Canton Classic Car Museum and sit in the Nash and for a moment recall all the miles we traveled across Ohio and all the friends that we made. we decided it was time to get a new, modern One Tank Trip car and following our earlier criteria we wanted an “orphan”, a car no longer manufactured. A 2007 Chrysler PT Cruiser Convertible filled the bill. And, most importantly, it has all the modern amenities like air-conditioning, a good heater and a power-raised top. I hope it becomes as popular with my viewers as the cars of the last three decades were. Love your new blog. I look forward to checking it regularly to see what you’re up to. Hopefully I am now registered. Please keep in touch and don’t be dismayed if I send you suggestions. NICE work on the blog and organizing the many, many nice Ohio travel stories you developed and produced over the years. It was a pleasure to go back through them. In addition to being a good friend and newsroom colleage at the old WJW-TV in the ’70s, I remember you too, as a solid and effective general news reporter. My best to you, family and all our former colleages, on and off the air. I was Director of Engineering at TV-8 from 1988-1996, you may remember me. Mark Thomas was my assistant, and Margaret Johnson was our secretary (actually ran the place). I remember going on the bus trip with you to see the “Phantom” in Toronto. I sent you down to see Connie Codarini of the “Four Lads” in Medina at Penny’s Poorhouse. He has since sold the place and retired in the Northwest, either Washington or Oregon. Great to see you are still active ! I retired from KPHO-TV here in Phoenix in early 2002, and have been busier then I was when I was working. Good to see the pictures of Kelly O’Donnell, and the gang. I remarried to Laura Darvas, daughter of Lou Darvas, many years sports cartoonist for the Press in Cleveland. Hi John, Thank you for the comments. FYI we are planning a story later this year on the various funeral home museums in the state. We will certainly be including your amazing collection. Mr. Zurcher, My sister works at a funeral home in Minerva. A couple weeks ago you surprised everyone by stopping in while doing research on the Lincoln Highway. She was thrilled to meet and talk with you. Since I live in Akron, I don’t have a chance to read your columns. Would it be possible to let me know when this article might appear in the Plain Dealer? Thank you so much. Hopefully…it will be published on Saturday, March 7th. Neil,thanks for the new site! A question if I may.we meet years ago and we talked about Hammered Dulcimers.I wonder if you found time to play the one you own. I still have a mountain dulcimer that I bang around on once in a while but the hammered dulcimer started collecting too much dust and my wife said it had to go. I never really learned to do much on it other than pick out a few tunes. I envy people that can play them well. Thanks for your comments. Please let your friends and colleagues know about the One Tank Trip blog. Wow. This site brings back many childhood memories of the old TV-8 days. As a matter of fact, TV-8 was the nickname we used for Melody when she first came to Ashland. I look forward to seeing future updates. Kim and I send our best to you and your family. Wonderful to hear from you. I will make sure Melody sees your comments. You made my mom’s day when you stopped by to see your “kid sister”. My children and I came to see you a few years ago at a book fair in Wooster to let you know she was still around and still had fond memories of you. Many years have come and gone but, Neil, you will always be her “big brother”! Thanks again for making my momma so happy that day…she got her mail today and that put a big smile on her face too! Thank you for writing Rose. It was great to see your Mom again. I’m an artist from San Francisco collaborating with another artist, Scott Minneman, on a project for this summer’s IngenuityFest in Cleveland in July. We would love to get in touch with you about the possibility of using some of your greater Cleveland stories on our Magic Story Table project. Please get in touch with me via my cell at 415.786.6906 or you can email me at jdbeltran@rcn.com. We are very much looking forward to being in touch with you soon! I had seen a long time ago about a one tank trip that you had at a hotel that you could only get to by airplane. Can you please let me know if it still exists and where I can find some information ? I don’t recall any place that you could only get to by flying. You might be thinking of a story I did several years ago about a bed and breakfast on Kelleys Island in Lake Erie that was located on the edge of the airport. The owner of the B and B was a pilot and had his own airplane and ask part of the deal when you booked a room, he would give you an flying tour of the Lake Erie Islands. That b and b has changed hands and I don’t believe they still offer the flight. Since we have not reviewed the place since it changed management I can’t tell you what they now offer. I’m looking forward to reading your forthcoming story in the P.D., per our discussion at Ferrante’s last Saturday. Sorry I didn’t have any business cards with me; it had been a long and grueling week on the road. I’d appreciate any information about future WEOL reunions. I put in just over 17 years there (mostly part-time and over 30 election nights), so perhaps I qualify to re-hash some interesting times. Thanks. Neil, I have to tell you that Carriage Trade has retired their business as of last year, 2008. We are not offering sleigh or carriage rides at the present time. If and when we do offer the service in the future, I will be sure to let you know. Neal, I am leaving the NKY CVB in the next week. Long story but position being eliminated. Wanted to intro you to Ed McMasters of the Cin USA Reg Tourism Network. He’s a contact for future stories about SE OH, NKY. Please reach out to him, he’s a great resource, emcmasters@staycincinnatiusa.com. If any of this jogs your memory and you know any stories that would be great if you could email me and let me know. Love your one tank trips.Keep up the good work. I do remember your grandfather. A wonderful man and a good Marine. Indeed we were fellow non-coms and I recall him as being a typical hard-nosed Sergeant but one with a wonderful sense of humor off-duty. The pillow story you refer to I do not recall but considering your grandfather’s sense of humor I am sure he was involved some how. You asked for stories: The one that stands out in my mind is while attending training at Camp Lejeune, N.C. A group of Sergeants, your grandfather and me included went on liberty to Myrtle Beach, S.C. Someone, probably John, suggested that even though we were in civilian clothes we should wear a uniform. So we marched into a clothing store and all bought matching wild Hawaiian shirts in red, white and blue then formed up on the board walk and marched from bar to bar telling everyone who asked that we were members of the Cleveland Gizeewhomper Marching Band in town for a performance that night. We were treated to drinks in almost every bar thanks to John’s ingenunity. I don’t think we spent even a dime. I just wanted to say that it nice talking to you at the Romanian Festival last week and that I hope you got a chance to check out my festival website (I just recently went to another Romanian festival in Canton). My thanks to you for showing all the wonderful things one can find in Ohio. This summer definitely hasn’t been a boring one by any means. Thanks for the note. It was nice meeting you too. I have checked out your blog and it is excellent. A much needed niche that you are filling. I hope you will add Onetanktrips.com to your list of favorites as I will do with your blogsite when I do my upgrade this coming weekend. I am a local author from the Salem, Ohio area. I am about to launch my second work of fiction, pieces. The novel is centered in Minerva, Ohio and highlights The Great Trail, Indian burial mounds, and the Hart Mansion in Minerva. My goal is to bring people in from our surrounding areas to show all this rural area has to offer. Visit my website for more info at http://www.karenbiery.com. Thanks for reading! A friend mind would love to go on those 1 tanks trips sometime next summer. I would love to get 1 of Neil Zurcher books. Please let me know if a 2010 books comes out soon. Thank you so much! There is a book out now, “Ohio Road Trips” that is available in most major book stores or on Amazon.com that offers over five hundred trips we have taken around the Buckeye State. A friend in Texas sent a few pix of a most unusual snowmobile for sale and it reminded me of your one tank trips. It started out as a 1957 Metropolitan convertible and actually looks really cool. I think you would get a kick out of it. My name is Amy Seng. I’m writing an article for “Cincinnati Parent” magazine on one tank trips from Cincinnati. I’d love to get a quote from Mr. Zurcher for the article. Is it possible for me to e-mail a few questions? I’m sorry, but I have been off sick and unable to answer some of the inquiries until now. Regarding your request, I am sorry but many of the photos we used are owned by other people and I would have to research the original photo to determine who owns the photo and whether it is copyrighted. In some cases there is a fee to use the photo. At the present time I am trying to catch up with paperwork from the time I was ill and do not have time to research the photo in question. Are you releasing a new edition of “One Tank Trips for Ohio” or something similar by end of 2011? Thanks! Looking for the the latest available for a Christmas gift. Thanks! Thanks for asking., My publisher, Gray & Co., says they are no longer interested in doing new versions of “One Trank Trips”. So, unless I find a new publsiher, the present edition may be the last. I might suggest to you my latest book, “Tales From the Road”, a memoir that gives many behind-the-scenes stories about One Tank Trips or, Ohio Oddities which is an updated version of the wierd things to see and do in Ohio. Hi, Neil. This is Brian Newbacher. I am trying to get a hold of you so we can follow up on our Fox 8 appearance recently. I have a site I’d like to recommend for a future One Tank Trip. It’s the beautiful High Bridge Glens park, located along a portion of the Cuyahoga River in Cuyahoga Falls, near Akron. The current Glens park, located at Front and Prospect streets, is built on the site of a former Victorian-era summer resort, which was also known as High Bridge Glens. The original Glens was once one of the leading tourist destinations in the area in the late 1800s due to its stunning natural beauty, charming dance pavilion and its early roller coaster – rumored to be one of the first in the U.S. Although the original Glens park and its structures are no longer with us, the new park still has some of the loveliest scenery in the area. The new High Bridge Glens park is located just south of two early Cuyahoga Falls dams which are scheduled for demolition this June/July 2013 – making this an ideal time to visit Cuyahoga Falls and witness history being made. I have researched the history of the original High Bridge Glens park for more than a decade and recently wrote the first pictorial history of the park – “High Bridge Glens of Cuyahoga Falls”, published by Arcadia. If you decide to visit the Glens this year and want to know more about this area’s colorful history, please feel free to call on me. In the meantime, I have provided a link to a local history Web site with information regarding the Glens. Thank you in advance for your consideration of this idea. I will look forward to seeing where future One Tank Trips take you next. Happy traveling! Thank you for the suggestion. I will certainly add it to our list of possibilities for this coming summer. Is t his a public park? or a part of Metro Park District? Thank you for the information on High Bridge Glens Park and the reminder about the Gorge Metro Parks in Summit county. I have long said that Ohio’s real jewel is our Metro Park system. some of the best places in the state and not very well advertised. We will certainly try to take a look at the parks sometime this year for a possible story. I just don’t know when. A great one tank trip would be Ghost Town, west of Findley. A retired man built an old west town; no one lives there. My name is Michelle Brody and I am the Lifestyle Director at Pioneer Ridge, a Del Webb community in North Ridgeville. I am interested in having you come out and speak to our homeowners about your One Tank Trips. How do I go about booking a presentation with you? I immensely enjoyed your presentation at Morley Library in Painesville, Ohio, yesterday. How nice to relax and hear your stories with the humor! Thank you for coming and for your wonderful contributions on TV. I look forward to reading your books now as they are all new to me. Thank you so much for the kind words. I hope you enjoy our blog at this site.